Source: “Duty Nobly Done” page 285. August 10, 1894 Born Born at Barrow-in-Furnesss, Lancashire, England. October 24, 1914 Enlisted Enlists with the 18th Battalion at London, Ontario on October 23, 1914. He had prior military experience with the 7th Regiment[ii] and was a 5’ 8.5” tall labourer. His next-of-kin was designated as his mother, Mrs. Maria Grosvenor residing at 8 Beech Street, Barrow-in-Furness, England. November 11, 1914 Anti-Typhoid Inoculation Signed by D.H. Hogg. November 22, 1914 Anti-Typhoid Inoculation Signed by D.H. Hogg. December 16, 1914 Vaccinated Signed by D.H. Hogg. April 15, 1915 Leaves London, Ontario Leaves to embark S.S. Grampian at Halifax, Nova Scotia for England. April 18, 1915 Embarks S.S. Grampian Embarks transport ship at Halifax, Nova Scotia. April 29, 1915 Arrives England Arrives with 18th Battalion at Avonmouth and the Battalion entrains to West Sandling for training with the 2nd Canadian Contingent (2nd Division). September 9, 1915 Admitted Admitted to Tent Hospital at St. Martin’s Plain. September 28, 1915 Discharged Discharged from hospital. 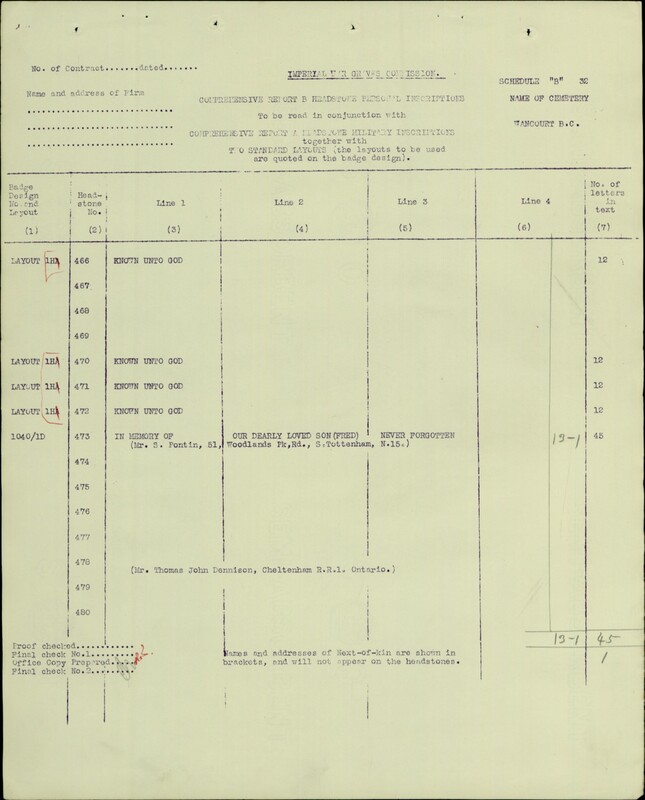 October 8, 1915 Transferred Transferred to the 48th Battalion. 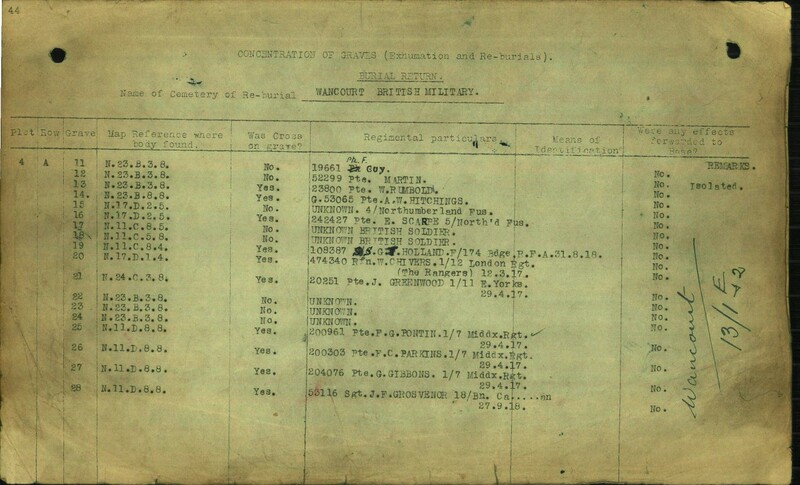 October 26, 1915 Transferred Transferred to the 18th Battalion. October 27, 1915 Arrives Arrives in the field with the 18th Battalion. The Battalion was in Divisional Reserve at La Clytte. July 6, 1916 Submits Will Leave real and estate property to this mother, Mrs. Maria Grosvenor, 8 Beech Street, Barrow-in-Furness, England. The will is witnessed by James Hutchison[iv] and George Bamiling[v]. September 16, 1916 Admitted Admitted aboard the Hospital Ship St. Patrick and transported to England. September 20, 1916 Admitted Admitted Kitchener Hospital, Brighton, England for slight wound to chest. October 8, 1916 Admitted Admitted to Military Convalescent Hospital, Woodcote Park, Epsom, England. November 10, 1916 Discharged Discharged to Canadian Convalescent Depot at St. Leanords to the 1st C.C.T.B. Battalion. January 24, 1917 Transferred Transferred to the 4th Canadian Reserve Battalion, Hastings. April 15, 1917 Taken on Strength T.O.S. from 4th Canadian Reserve Battalion to the 18th Battalion. May 26, 1917 Struck off Strength S.O.S. to 18th Battalion. May 28, 1917 Arrived Arrived from 4th Canadian Reserve Battalion to the Canadian Infantry Base Depot, Etaples. June 15, 1917 Arrived Arrived with the 18th Battalion in the field. The Battalion was resting and refitting at Barlin, France since June 4. August 21, 1917 Promoted Promoted Lance-Corporal vice L.Cpl. J.A. Egan promoted. November 16, 1917 Promoted Promoted Sergeant as Sergeant F.G. Jones was promoted. “At 3:00 a.m. following intense 5 min. barrage Bn. jumped off TILOY [sic] TRENCH in front of TELEGRAPH HILL in support of 21st Cdn. Bn. The artillery preparation was good. Owing to getting lost in the darkness, the tanks detailed to go over with the Bn. failed to turn up per schedule, so the Unit was without their assistance in the initial kick-off. MINORCA TRENCH, a difficult nut to crack, was set as the first objective, and SOUTHERN AVENUE TRENCH as the second objective. Both positions were won by 8.00 a.m. “D” Coy. holding the last named defence line in conjunction with the 21st Cdn. Bn. “A” Coy. remained in GORDON TRENCH, and “B” Coy at the first objective, MINORCA TRENCH. Up to this time the casualties had been far smaller than anticipated, although Lieut. McHardy had gone only a short distance from the Assault trench when he sustained mortal shrapnel wounds. Lieut. Brackin [sic], who had done brilliant work up to this moment, was instantly killed by a shell and Capt. Parsons and Lieut. Edwards sustained wounds that resulted in their immediate evacuation. It is difficult to know at what point of the day that Sergeant Grosvenor met his fate. The Battalion was in very active operations in that part of the month, along with the Canadian Corps, pursuing the Germans as part of “The Last 100 Days”. 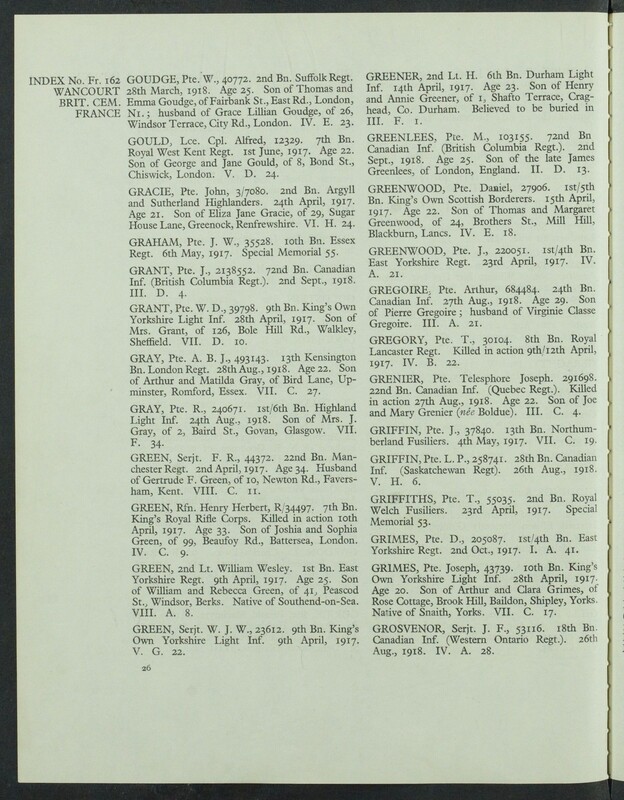 Post August 28, 1918 Interred Sergeant Grosvenor was later interred at the Wancourt British Cemetery. He is buried along with 21 other Battalion brothers at plot IV. A. 28. Two members of the Battalion lie in graves beside him. December 2, 1920 Scroll Despatched Scroll No. Z2868 despatched. To Mrs. Maria Grosvenor residing at 8 Beech Street, Barrow-in-Furness, England. April 15, 1922 Plaque Despatched Plaque No. P35450 despatched. To Mrs. Maria Grosvenor residing at 8 Beech Street, Barrow-in-Furness, England. November 13, 1920 Medals and Decorations Victory Medal, British War Medal, and 1914-1915 Star per (M) C30487. To Mrs. Maria Grosvenor residing at 8 Beech Street, Barrow-in-Furness, England. 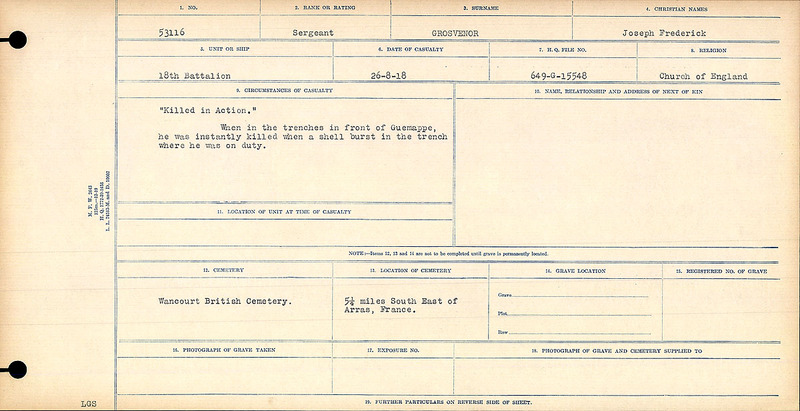 [i] The Summary of Service for this soldier is meant as just that, a summary of his service. It is not intended to be an exhaustive biographical relation of his life or his war service. Some information may be deliberately suppressed by the author out of sensitivity to the soldier. 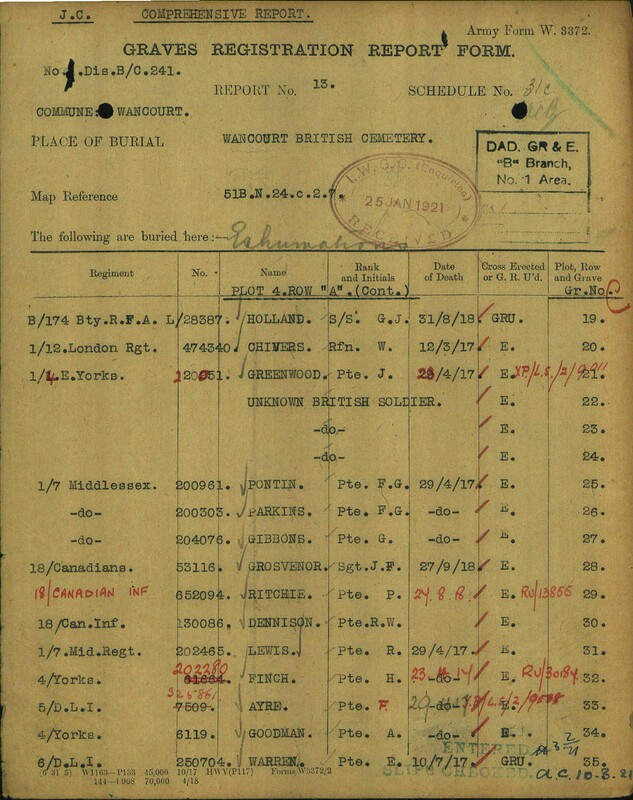 Readers are encouraged to reference the actual service records available at the Library and Archives Canada in PDF format if they wish to learn more about this soldier. Such additional information (i.e. hyperlinks etc.) are for informational purpose only and no claim to verification or accuracy is made by the author of this summary. [ii] It is not known to which this unit refers. Is it a Canadian or British unit? 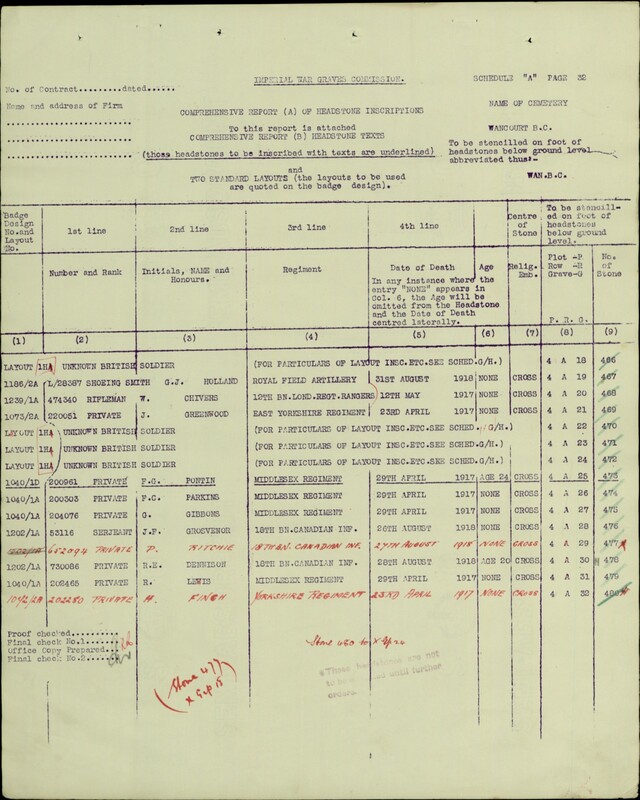 [iii] Note that most pay was assigned by members of the Battalion in March 1915 before they left for England. [iv] Most likely Hutchinson, James: Service no. 403377. [v] Bamiling, George: Service no. 424385. “Killed in Action” When in the trenches in front of Guemappe, he was instantly killed when a shell burst in the trench while he was on duty.